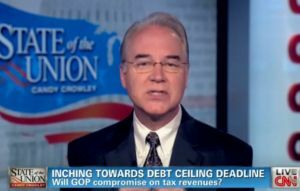 By Jim Tharpe on Wednesday, November 30th, 2016 at 12:00 a.m.
Rep. Tom Price, R-Ga., says the U.S. can avoid default if it simply uses incoming revenues to pay bondholders. But doing that could leave other federal creditors high and dry. U.S. Rep. Tom Price, a orthopedic surgeon who has represented his Roswell-based House district for 12 years, was picked Tuesday by President-elect Donald Trump’s to be scretary of health and human services. Price has been an outspoken critic of the Affordable Care Act as well as the federal tax code and the soaring national debt. The congressman has also spent some time on the AJC Truth-O-Meter over the years, courtesy of the non-partisan fact-checkers at PolitiFact and PolitiFact Georgia. To comment on any of our rulings, or to offer an alternate ruling, readers can go to www.facebook.com/politifact.georgia/. Prices’ figures, used in two Twitter posts, can be traced to the IRS’ independent ombudsman. Those figures, while difficult to quantify, have become the accepted standard for calculating compliance time and costs. We rated Price’s claim True. New federal projections estimate that the health care overhaul "will cost $1.76 trillion over 10 years — well above the $940 billion Democrats originally claimed." This jump was far less than what Price’s numbers suggested. PolitiFact National also considered what the projected cost of the health care overhaul would be if it took into account aspects of the plan that would pay for some of the care. It felt this "net" cost number would be a more complete portrayal of the plan’s costs. It found that these net cost projections actually declined. The CBO’s 2010 estimate totaled $784 billion. The 2012 report revised it downward to $768 billion. Price’s claim that the health care overhaul "will cost $1.76 trillion over 10 years — well above the $940 billion Democrats originally claimed" uses numbers that are not comparable to make an incorrect assertion. When you do the math correctly, the gross cost projection increased by less than 9 percent. We rated Price’s claim False. The congressman’s number was sensible, but his language was a bit overheated. It’s not clear that the physicians who drop or restrict Medicare were "forced" to do so because of declining reimbursements or red tape. Many of the primary care physicians responding to the Center for Studying Health System Change survey said one of the reasons they accept so few new Medicare patients is that their practices are full. We rated Price’s statement Mostly True. Sixteen thousand new Internal Revenue Service agents will be "empowered to enforce" the new health care legislation. The IRS did have to hire agents to implement these changes. But Price’s statement misstated the findings of a partisan estimate. Ways and Means Republicans said that about 16,000 "employees," not "agents," may be hired to enforce the bill’s provisions. They also acknowledged that the actual number of hires may be lower. IRS budget requests for the 2012 and 2013 fiscal years show they asked for about 375 more agents — far less than 16,000. And like other pols who have used versions of this talking point, Price used such a specific figure that he suggests a degree of certainty that doesn’t exist. We rated Price’s statement Mostly False. The White House didn’t dispute that aides portrayed Republicans that way. But a spokeswoman said the Democratic health care plan includes many amendments that were proposed by Republicans. Still, Price is right. Obama and his aides did sat the Republicans had no ideas on health care and other issues. We rated Price’s statement True. Academics did conclude that only a fraction of what Medicaid spends directly replaces what its beneficiaries would have had to pay for their health care costs. But even the Medicaid money that doesn’t replace the beneficiary’s own spending does pay for their health care. This conflicts with the resolution’s claim that the paper showed that Medicaid’s "value to its beneficiaries is significantly lower than the actual cost of the program." The statement is partially accurate but leaves out important details. We rated Price’s statement Half True. See links for specific sources.